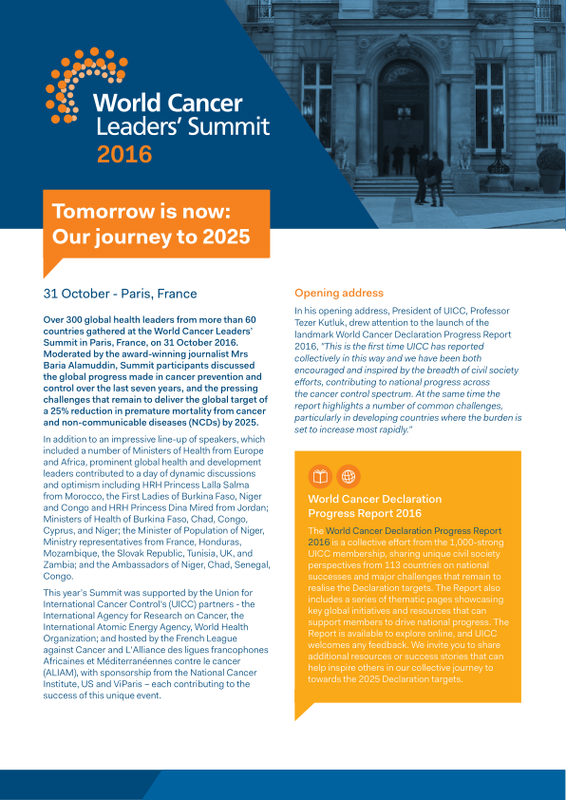 The 2016 World Cancer Leaders’ Summit was held in partnership with the International Agency for Research on Cancer (IARC), the International Atomic Energy Agency (IAEA) and the World Health Organization (WHO), and took place on 31 October at the Hotel Salomon de Rothschild, Paris France, in conjunction with the 2016 World Cancer Congress. 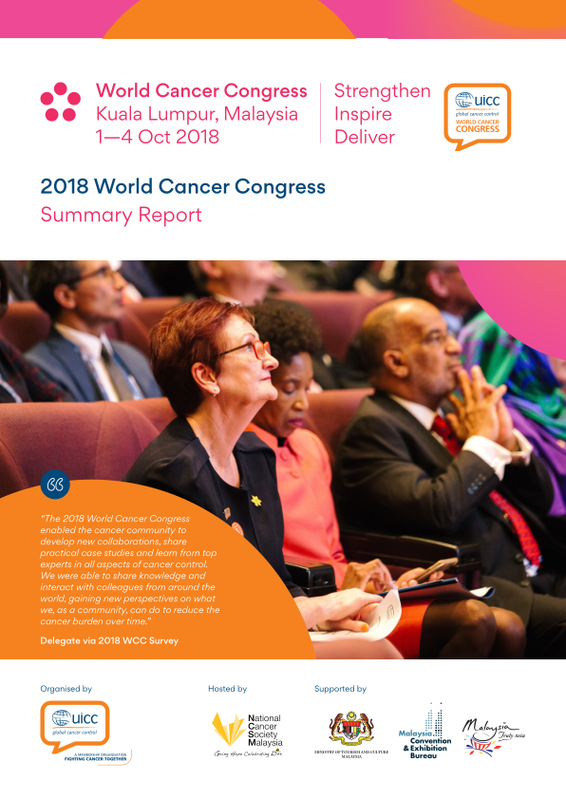 Despite substantial progress at the global level, in many countries, efforts to develop and implement effective national cancer control plans are seeing limited success, mainly due to a lack of resources, a low awareness of the cancer burden and a poor understanding of the potential for cancer prevention. 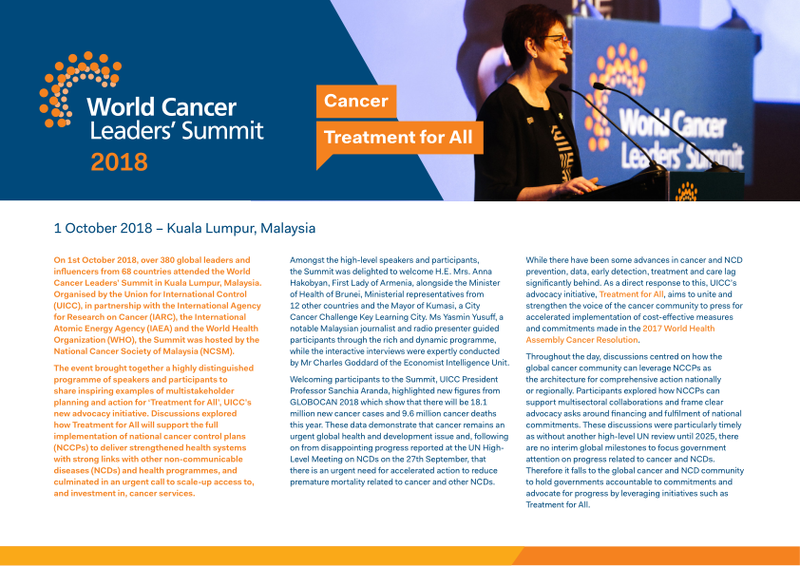 An exceptional roster of 300 political and health/cancer leaders, policy makers, civil society and private sector representatives addressed these burning issues at the Paris Summit, as we enter the last decade towards the goal of reducing premature death from cancer and other non-communicable diseases by 25% by 2025. Ministers of Health from Europe and Africa as well as leaders from UN agencies and cancer organisations shared examples of concrete actions to advance cancer prevention and control at regional and national levels, including in the areas of cancer awareness, patient advocacy, research, access to treatment and care, training, and financing. The event concluded on a strong positive note with a call to action to the global cancer community to work together to support the adoption of a cancer resolution by Member States at the 2017 World Health Assembly.